If you're looking for more distance and forgiveness from a fairway wood then Callaway will have something for you. They employ a number of groundbreaking technologies to help you hit it longer, and create outstanding ball speed on all areas of the face. They have a fairway wood to suit every player and every type of ball flight, from the distance driven XR and XR pro models, to the lighter Big Bertha V Series which helps create a greater clubhead speed for more distance and the Big Bertha Alpha 815 fairway which allows each individual to dial in the ball flight with both loft and CG adjustment which lets you get the most from your game with any course or weather conditions. 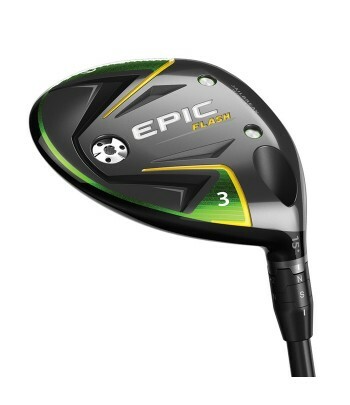 The new Epic Flash fairway woods feature the groundbreaking new Flash Face Technology. Maximum Distance from Next-Gen Hyper Speed Cup Face Refined forged face cup designed to optimise ball speeds across the entire face promoting maximum distance. The impressive Callaway Rogue Fairway Woods feature the same Jailbreak technology as the drivers with Facecup technology for powerful, accurate shots.